The word is out: Defense Secretary Chuck Hagel has nominated Gen. Joseph Dunford to be the 36th Commandant of the Marine Corps. 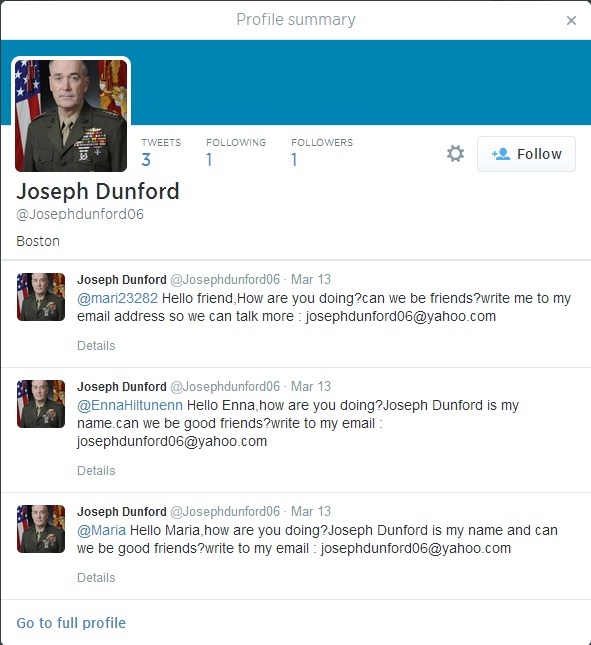 On Twitter alone, I counted ten different accounts using images of the real Gen. Joseph Dunford. Some include snippets of his biography, and some tweet bizarre messages at other users asking them to email an account so they can begin a friendship. All of them have fewer than 20 followers. An example of a phony Twitter account run by a spammer impersonating Gen. Joseph Dunford, nominee for 36th commandant of the Marine Corps. As it turns out, Dunford’s identity and images have long been appropriated by scammers hoping to make a dishonest buck. “How are you pretty lady? I am Gen. Joseph F. Dunford Jr of the US Army,” began one “romance scam” message that was flagged on the website Scamsurvivors.com. That message, from the dating site Netlog.com, was accompanied by real Defense Department photos of the four-star Marine general. Dunford impersonators have also been known to reach out to strangers via Skype. In a lengthy exchange recorded on a private blog, a scammer who claims to be Dunford says he is a divorcee who is looking to remarry after retirement. Other direct email scam attempts have been recorded at various phishing watchdog sites. It’s not clear why Dunford has been singled out for this malicious activity–the Defense Department makes images of its senior general officers widely available. Army Chief of Staff Gen. Ray Odierno, another frequent victim of online identity theft for phishing scams, has spoken out publicly about the problem. But this could complicate Dunford’s relationship with social media, if he does choose to create accounts at his new post. Current commandant Gen. James Amos has no public Facebook page or Twitter account, and Dunford appears to have no Twitter presence thus far. This Facebook page bills itself as Dunford’s only real account and posts military photographs, but has yet to be verified and appears somewhat suspect. For now, you can confidently follow the International Security Assistance Force, Dunford’s current command, through its verified account on Twitter. For everything else, click with care. Yes, no doubt it has been used for various networking sites and all say that he is separated, that need to rescue a large amount of money and has to declare who is dating and wants to marry, when out of combat. I go to meet with you. And women who have become enchanted and amounts that would divest its reserves. Have women who have attempted suicide. I was very indignant, not because I realized I was in front, there’s something wrong. I researched a lot and have warned people that can be scammers who want money. But it is difficult because they are dazzled by words of love and not believe. I see he (General Joseph Dunford) is a humble person, knowing what he is doing, great connoisseur of the human mind, great strategist and the articulator. I am very happy that he is the new commander of the 36th Marines, congratulate proudly unfortunately do not know him personally, but from what I read and I have followed worthy of being the commander, I hope it finishes successfully in Afghanistan. I am sure do. Reporting for all people who start talking with General Joseph F. Dunford Jr.. All are false, General Dunford, can not stand taking time to talk with many people at one time and another thing does not even have time to even talk with your family. I’m alerting you to see if we end up with people who are using and manipulating his image as a great leader of peace, try to solve all problems at its headquarters at that moment being in Afghanistan. It is a lot of responsibility, we will try to end it all. Annoy a great diplomat , a great organizer, a wise, humble and serving a great nation. And also not only the General Dunford is being used, but there are several, official emphasis on the General Dunford and the American army , Australian, or even the UK and internationally to people with influence. We have several organizations that are working to end it all. It’s easy to try to manipulate people who are in love problems, heartbroken or even particular problems and take advantage to try to get money and fail, leaving the person in misery and even has people who commit suicide. It is very sad we have try to stop it. We are a small grain of sand in the world for people with bad character. But maybe able to calm people down, easing the pain of his heart and looking to know who is talking and knows the Internet. Search there are several sites of scammers and news about it. And watch out for bad people. Ich gratuliere Gen.Joseph Dunford für sein Nominierung -das ich nich einfache Arbeit – volle Verantwortung und Kampf.